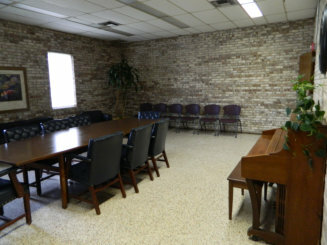 The Civic Center is located at 716 Mae Street and consists of a large room with a stage, a small conference room and kitchen facilities which are available to rent for a number of activities. The Civic Center is a great place for weddings and receptions, as well as family or school reunions. Also available for rental purposes is the Kali Oka Club House. See the documents to the right to download the Application for Use of Facilities and the Rental Fee Schedule. For additional information on renting the Civic Center, please call 251-679-5511. The Saraland Chamber of Commerce hosts their monthly luncheon at the Civic Center the second Tuesday of every month. Line dancing classes are held on Tuesdays from 2-3 pm. Hip Smith is the teacher. These classes are free. Widowed persons service group meets on Tuesdays from 10 – 11 am. A Senior Dance is held on the 3rd Friday of every month from 6:30 – 9:30 pm. Admission is $5. Exercise classes meet Monday, Wednesday, and Friday from 9:30 – 10:30. These classes are free. 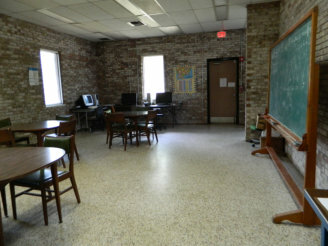 Also offered at the Saraland Civic Center are Adult Education classes. These classes prepare students to take the General Education Development test (GED). The GED is a battery of five tests that when passed stand as equivalent to a high school diploma. Before entrance into a class, all students must first be tested at the Carver Campus of Bishop State Community College, located at 414 Stanton Street in Mobile. Tests are offered on Monday and Thursday mornings at 7:30 a.m. Only 20 people are accepted each morning, so make sure you get there early! After completion of the test, your test results will be sent to the class instructor at your chosen location. The Civic Center offers classes Monday through Thursday from 9:00 a.m. until noon. For more information, call the Carver Campus at (251) 405-7000. 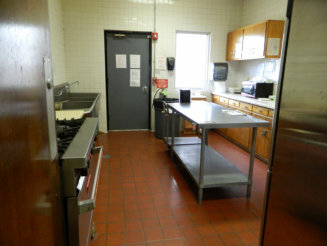 Shown below are pictures of the small meeting room, the kitchen and the education room at the civic center.